Works Great in the Kitchen, Dining Room, Bar or Anywhere. Fragile Protection: This wine glass holder can hold a variety of glasses and is great for entertaining. Stylish Contemporary Design: This holder looks great with a variety of retro styles and bronze finishes. Different style,different visual enjoyment. The countertop wine glass holder is detachable and can be easily carried and moved wherever you need it. The Holder is with a circle base, which is firm and not easy to dump. Great stability, worry free from dumping. Full support is smooth and visible. 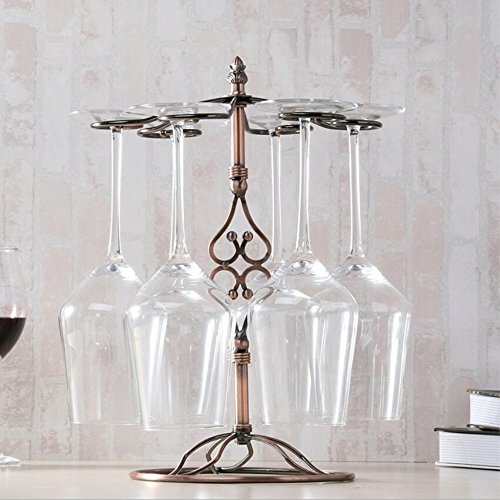 PLACE SIX RED WINE GLASS CUP : The Wine Glass Holder curled horizontal hooks arranged in a circle on the top section can hold up to 6 wine glasses up to 25 cm / 10 inches tall, elegant, safe and convenient.Fit most wine glass cup.Different style,different visual enjoyment. PROTECTION OF WINE GLASS CUP: The Wine Glass Holder Stand is designed to protect the wine glass and keep the supplies dry, clean and fresh, so as to prolong the life of your facilities. For better hygiene. Please note that wine glass and bottle of red wine are not included in the package. Easy to Store: The countertop wine glass holder is detachable and can be easily carried and moved wherever you need it. The Holder is with a circle base, which is firm and not easy to dump. Great stability, worry free from dumping. Full support is smooth and visible. PREMIUM QUALITY: Made of stainless steel, high quality bronze-tone metal, this wine glass holder is with bright appearance and thick texture. Scratch proof and bump proof, easy to clean.Adds both sensible storage and a decorative touch to your dining room, kitchen counter or bar area. Warranty & Friendly Customer Service: We have a commitment to every buyer 100% satisfaction. After all, we are customers, too. So if you have any problems about our Coffee4u wine glass holder rack, just contact us, we'll settle the issue according to your willingness. If you have any questions about this product by Coffee4u, contact us by completing and submitting the form below. If you are looking for a specif part number, please include it with your message.